Damian Heath, chef at Lot 12 Public House of Berkeley Springs, has been named a semifinalist for the prestigious James Beard Award. 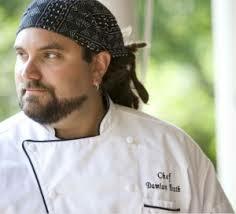 Heath was nominated as best chef in the Southeast. The finalists will be announced at the James Beard House in New York City Tuesday, March 24 and the winners at the James Beard Awards gala will be held at the Lyric Opera of Chicago on May 4. A cookbook author and teacher, James Beard was a champion of American cuisine who helped educate and mentor generations of professional chefs and food enthusiasts. Damian Heath grew up in Berkeley Springs, the son of award-winning artists Jonathan and Jan Heath. His career began not at a culinary institute, but at the University of North Carolina at Wilmington, where he studied philosophy and art history. After two years of undergraduate studies, he went to the renowned Baltimore International Culinary College. While in culinary school, he trained in Europe under Executive Chef Peter Timmins. When he returned from Europe, he worked at the Yellow Brick Bank Restaurant in Shepherdstown, WV as sous chef when he met his future wife, Betsy. Betsy also grew up in the eastern panhandle of West Virginia, in Berkeley County. She was attending Shepherd College, pursuing a BA in Fine Arts, when she and Damian met. Upon leaving Shepherdstown, they moved to Charleston, South Carolina. Damian worked in several upscale restaurants further developing a love of southern cuisine and local fare. Betsy worked closely with the opening of an upscale restaurant in Mount Pleasant and they both were employed by caterers in the downtown Battery area. The two were approached to open and manage an upscale bistro on the Outer Banks in North Carolina and in December 1997 they moved to Buxton, NC. In April 1998, the bistro opened with rave revues. Damian’s menu was revolutionary for the area, business was wonderful and they had a great first season. But Damian’s vision for his ideal restaurant remained in his hometown of Berkeley Springs, knowing that it would be a great environment for a small, upscale and eclectic restaurant. In January of 1998, an old house on Warren Street in Berkeley Springs — where Lot 12 is now — went up for sale. The Heaths had been discussing their future and knew that Berkeley Springs was their destiny. Once they saw how perfect the house was, it was settled. In November of 1998, when their obligation to the bistro was fulfilled, they moved back to Berkeley Springs and after getting married in November of 1998, dove head first into the business and haven’t looked back. Lot 12 Public House opened for business on August 12, 1999.